"Modern Prespectives: A Collective Exhibition"
The Agora Gallery presents the exhibition - Modern Prespectives: A Collective Exhibition. Works by Tom Heid, Kim Stratford, Renata Castilho and Todd Williamson will be on show. Tom Heid�s geometry is a loose, musical, expressionistic one whereas Kim Stratford refines the grid. The worlds that Renata Castilho creates on her canvases are full of vibrancy, textural complexity and energy. Todd Williamson uses pure color to convey emotional intensity in his startlingly vivid paintings. The exhibtion will be on view until December 13, 2005. Renata Castilho's color choices are bold, creating a feeling of movement and sensuality. The abstraction of her work allows the reader to experience pure color and form, which expresses the essence of an image in an evocative format. Castilho often contrasts her geometric forms with a fluid, delicate image. The result is a juxtaposition that startles the viewer into a more intimate relationship with the painting. Castilho�s work possesses an expressive ambient quality that is as inspiring as it is alive. Renata Castilho is originally from Sao Paulo, Brazil. 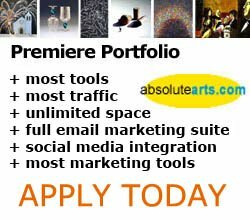 She has been exhibiting her work for five years and has shown in the U.S., Eastern Europe and China.Renata Castilho has been a Premiere Portfolio Artist at absolutearts.com since 2004. View more of her works at http://www.absolutearts.com/portfolios/r/reart/. Much like Rauschenberg, Kim Stratford's construction of flat shape color exists on planar field. Moving across the picture she adds dimension that expands the on surface rather than projects inward. This creates a sense of space similar to a microscope slide or aerial view. Thick paint is applied in autonomous chucky strokes. They are authoritative in size but subtle in texture. Moving between the non-objective and the subjectively elusive, she explores the formative process. Her vehicle and subject is the stream of consciousness capture of fleeting moments. She uses color, shape and abstraction to produce a kind of formal denouement. Born to into an artist family, she grew quickly acquainted with the plastic arts. A diverse appreciation for music, art and design cross-pollinated. For the last 30 years, Stratford�s work has been widely collected throughout the US. She has exhibited across the US and will represent the US in Florence, Italy in the 2005 Biennale. A tremendous colorist, Ton Heid creates a symphonic vibration composed of simple form, line, and color. Light and airy in the same way Matisse depicts a harmonious space in Open Window, Heid also captures the pleasant allure of organic shape and a colorful rectangles. With hardly a hint of black, Heid�s colors are skillfully bold, at times muted, and show a keen knowledge of composition and structural weight. Preserving the rectangular format of the canvas, he echoes the structure with a playful geometry. Open and airy describe his sensibility for organizing color and shape. Heid�s gestures are formal with a nod towards expressionist narrative. The artist�s hand guides the viewer through a dance of brushy lines that keep rhythm in within a medley of color. Psychologically reaffirming, the lush colors and shapes present life as idyllic and abstract. Movement is constant, change is inevitable, and nothing is predictable. Conceptually and optically pleasing, Heid�s magical works satiate the most diverse visual appetites. In the tradition of painters like Mark Rothko and Clifford Styll, Todd Williamson dispenses with images in order to bring the viewer fully into his psychological landscape. His paintings rely on saturated color fields that drift in and out of intensity, imbuing the canvas with dimension and texture. Williamson�s work attempts to capture a fleeting sensation with intuitive color choices; the viewer may experience a sense of recognition or nostalgia when viewing Williamson�s work, as if finally seeing an emotion. His use of line creates a sense of movement, while at the same time implying that order itself is transient and unreliable. Todd Williamson studied at the California State Los Angeles and the Belmont University in Nashville. He has collections all over the U.S. and Europe.